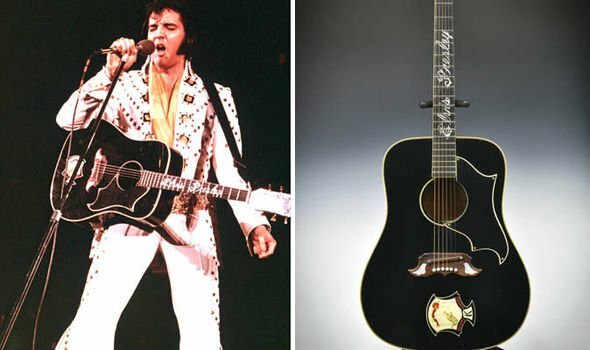 Home Tags Posts tagged with "elvis presley guitar"
One of Elvis Presley’s guitars has sold for $334,000 at an auction in New York. The guitar was given by his father, Vernon Presley. It is thought that Vernon Presley changed the finish on the Gibson Dove to black after his son earned a black belt in karate. Elvis Presley gave the guitar to a fan during a concert in North Carolina in 1975. Auctioneers Julien’s also sold John Lennon’s handwritten lyrics for The Beatles’ Being For The Benefit of Mr. Kite! for $354,400. Other items in the sale included a red neoprene vinyl jacket which Michael Jackson wore for his 1996-97 HIStory world tour, and Elvis Presley’s first piano. Michael Jackson’s jacket sold for $256,000, over four times the pre-sale estimate, while the piano fetched $140,025 – about $60,000 under what had been predicted. Lady Gaga’s first piano, which had been valued at $100,000, failed to find a buyer, as did Stevie Ray Vaughan’s Fender Broadcaster electric guitar, which was estimated at over $400,000.